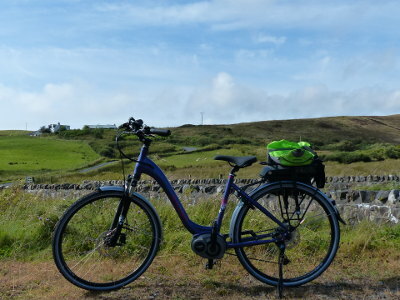 Cycling on Islay can be great fun, with varied scenery and abundant wildlife all around. You can see so much more from a bike. However, do be aware that Islay's weather can be unpredictable at any time of year, and come prepared. We have a range of quality bicycles for hire - mainly Raleigh and Diamondback - and with Jim as a cycle mechanic, we can reassure you that they are maintained to a high standard. We can offer a choice of touring bikes, hybrid bikes, mountain bikes or racing bikes, with men's or ladies' frames in a range of sizes. Children's bikes are also available, as well as a trailer and child seats for very young children. 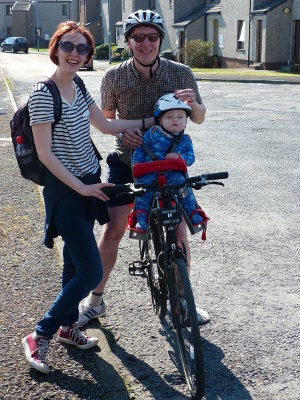 We also have a tandem, currently available at the same price as a standard adult bike, and a "tag-along", to add a child tandem-style to an adult bike. Safety lighting is included when required. High-powered lighting for longer night rides is available at £10.00. Panniers, etc. can be arranged; advance booking for these is recommended in busy periods. We also keep a range of helmets to ensure you can find the proper fit. We now have one electric motor assist bicycle in response to requests from our less able customers. It is a high quality Raleigh Captus 50cm step through frame, with Bosch motor. If you have a medical problem or disability but would like to try some cycling or keep up with your able-bodied companions, this may be for you. Being a micro business, we do not have the resources to operate more bikes at this stage, so we'd appreciate enquiries only from those who really need the service. The going rate is higher elsewhere but we will only charge £30 per day with a superb weekly rate of £120. Unlike other hirers, we do not charge for additional equipment such as panniers and helmets which can add upwards of £10 per day to your hire costs. Our charges are simple and all-inclusive so you can enjoy your cycling in safety and comfort. We value cycling, we value you. Includes helmet, and pannier bag if required/available. 20% discount on all hires for Cycling UK members. Discount rates for accompanied children. 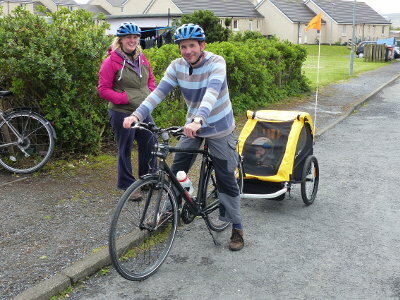 Special Offer: discount rate of £15.00 short hire for Port Ellen to Ardbeg cycle path only. For photos of the bicycles, please visit the Hire Fleet page. Child seats are available for the smallest members of the family, at no extra charge when hired with an adult bike. We have a front-mounted seat for babies in the 9kg - 15kg (20lb - 33lb) weight range, and a rear-mounted seat suitable for children up to 22kg (48lb). Great for a family day out! 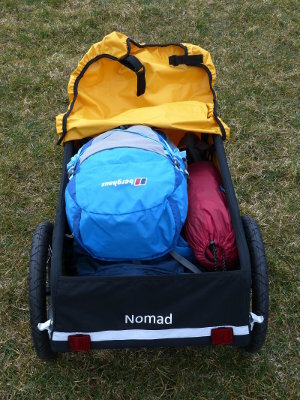 Unlike many hire businesses, we make no charge for extras, such as pannier bags or cycling mitts. We also have a selection of field guides and maps which you are welcome to borrow, again at no charge. However, donations in our charity box to help us buy a bike for Africa are greatly appreciated. Booking is advisable, especially for groups or during busy periods. Telephone 07760 196592 or e-mail enquiries@islaycycles.co.uk. A deposit or payment in advance may be required for bookings for peak periods. Payment may be made by cash or UK bank cheque, and we also accept Visa and MasterCard/Maestro card payments. Advance bookings can also be paid by BACS, or we can arrange to send a PayPal invoice. Carol's Cabs (01496 302155, or 0777 578 2155), Jim's Taxi (07497 528633) and Islay Taxis (01496 850170 or 07771 921157) taxi services are able to transport bicycles as well as cyclists, so if you get carried away and need a helping hand to get home, you can give them a call. They can also provide a service to transport your luggage from the ferry to your accommodation, leaving you free to pick up your bikes and cycle there at your leisure. If you have enjoyed your visit and appreciate the service, then please add a review to Trip Advisor, Yelp or Google. Thank you.